news US software giant BMC has released survey findings revealing that mainframe usage continues to grow – both globally and in Australia. In its tenth annual Mainframe Research Report, BMC indicated that the key factors driving the mainframe’s continued growth are “security, availability, superior data server and transactional throughput”. BMC’s survey polled users of mainframe servers for IBM’s zSeries about their perceptions of the sector, their outlook for the next year, the factors that drive continued investment, expected growth rates, and so on. Globally, security was considered the most important factor, with 56% of respondents saying that they see the security strengths of mainframes as a benefit. Availability was also an important factor, as cited by to 55% of those who replied. Additionally, 48% of customers continue to invest in mainframe due to their centralised data server capability, while 45% said mainframes best suit their transaction throughput requirements. Looking specifically at Australia, 97% indicated that the mainframe’s long-term importance is dependent on its ability to perform well as a platform for security, mobility and growth of apps, while 62% expected the mainframe would continue to grow and attract new workloads. Eighty-six percent said growing MIPs consumption and investment was being driven by security, and 79% because of centralised data server capability and availability advantages. 71% said transaction throughput requirements are best suited for the mainframe. Regarding growth, 8% of Australian respondents expect general purpose MIPs growth of more than 10% over the next two years, with 46% suggesting growth between 1 and 10% – a more optimistic forecast than elsewhere. Looking ahead at the next 12 months, 94% of Australian respondents said they will focus on cost reduction and optimisation, and 69% on application availability. This differs significantly from the international group, of which 65% said they plan to focus on cost optimisation and 59% on application availability. These figures, says the BMC report, underscore the challenge in IT to balance delivery of innovation with efficient operation within an industrialised infrastructure. Further, it is notable that business/IT alignment, data privacy, data recovery and application modernisation all tied as the number three priority globally – all being vital to successful digital transformation. “Mobile services with their need to be always on, always available to consumers, are driving increased interest in mainframe technology due to its ability to speed the delivery of secure data coupled with its high availability,” said Bill Miller, President of ZSolutions Optimization at BMC. Over the last 10 years, mainframes have continued to stay relevant and resilient, with 90% of respondents predicting the continued long-term staying power of the platform, and 83% consistently forecasting steady and growing mainframe capacity. Although, be nice if IBM made using virtualisation a little easier (read cost effective). In 2000, IBM renamed the existing System/390 to IBM eServer zSeries. 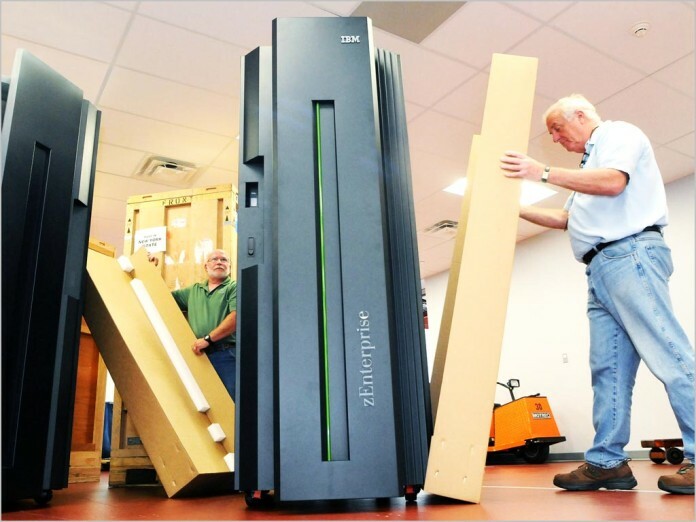 IBM Z Series is an awesome machine officially launched in April 2006 and referred to the new z900 and z990 generations of mainframes. But you won’t find many installations in backwater Australia. The 21st century mainframe is not just a monolithic machine anymore. It can run multiple virtual machines for Linux (Redhat & SuSe) and Windows Server 2012 without even blinking an eye.